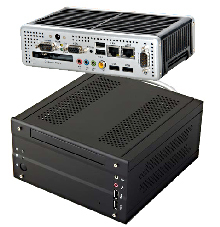 Fanless Industrial PC’s are an energy-efficient solution in a lightweight system, featuring both performance and reliability in industrial grade non-stop system operating. Designed to offer maximum computing power with the lowest amount of power consumption in the most efficient footprint possible. With the dimension and performance features Fanless Industrial PC’s are built for gate control, public information, self-service system, POS, Kiosk, retail automation, low-power budget devices, LED signage and logistic system applications. Some versions are also built for applications in health care automation, industrial process control, media servers, gaming machines and VoIP. A variety of hardware specifications are possible. Built with aluminum chassis, fanless design. Ready-to-go certified and prepackaged configuration. Small footprint, high performance-per-watt boards.